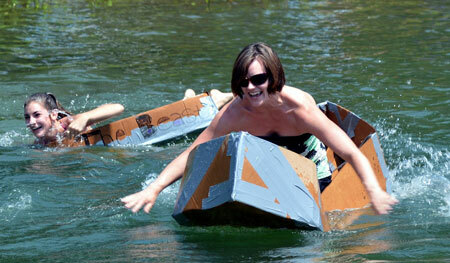 The popular Cardboard Boat Building Activity at the Blue Ridge Chapter’s Lake Chatuge Show started in 1997 as a way to bring together families and attendees at this fun event. Being given two sheets of cardboard and a roll of duct tape, the participants are challenged to create a boat that will float as they paddle them across the water following the build. The first year the boat build was planned as an adult activity. Several adults participated, but it was the excitement on the children’s faces that changed the course of this activity and it has been primarily a youth activity since, although we do always have an adult class. The participants are given two hours to construct their boat in whatever style they wish. Although some people build traditional designs, most often we hear a young child explaining to their father or grandfather how they want their boat to look! Whatever the design at the conclusion of the build, they are sleek styles in the eyes of the children. Following the two hour window for the build, the banks of the lake will be filled with local visitors and boat show attendees as they eagerly await each year to see which boats will float as the kids paddle between two dock ramps. What excitement is in the air as they don their life jackets for this paddle! With the crowds cheering everyone on, each participant tries to paddle their boat across the water. Dads are welcome to be in the water to help propel the boats along. The activity was quickly recognized as one that brings both families and participants together. What a special sight to see parents and children spending two plus hours together in such a focused project. Those not actually building are also involved as they make suggestions and encourage the designs to completion. Everyone is a winner in the completion of the boat…whether it truly floats or not….and all leave with a sense of accomplishment as they begin to redesign and make plans for the following year. In following the Cardboard Boat Building the Blue Ridge Chapter became encouraged to further a youth program. For the very young boat lovers the Blue Ridge Chapter has a toy boat assembly and painting activity during boat shows. We currently have a Youth Boat Building Project at one or more Blue Ridge Chapter boat shows each year. The onsite youth boat building is coordinated and lead by a Blue Ridge Chapter member whose skills help the youth and at the end of the day one of the youth wins the completed boat. Antique boaters and spectators hear busy hammers and this event always draws a crowd to watch and encourage the youth in this project.The youth have to be old enough to read plans, use small hand tools, and follow instructions for building a boat. Blue Ridge Chapter also has a Hagarty Youth Judging Program. These young judges learn the basics of judging while viewing boats in the show, they interact with the boat owners to learn details, facts, and the history of these boats. The youth receive a Hagarty hat, T-shirt and official judge’s badge and are lead in this program by a Blue Ridge Chapter member. The Blue Ridge Chapter encourages youth to learn, experience, and carry on this fun and exciting hobby of a lifetime.